I only ever raced in this race once – a Clydesdale Harriers team went through and we actually won with Allan Faulds, Ian Donald and Doug Gemmell being the counting runners. It was a good, hard two lap trail with an enormous climb to be done soon after the start of the lap and there was a long downhill run beside the golf course before turning into the finish at King’s Buildings. Enjoyable race over a king of fiercely undulating trail but I didn’t go back! Colin Youngson has written the account below. The Edinburgh University Ten Miles Open race took place in mid-February or early March and I first ran the March 1st 1971 version. The Aberdeen University newspaper ‘Gaudie’ reports only that Don Ritchie was 5th in 50 minutes 8 seconds and that I managed 8th and a PB for the distance of 51.04. However I won the handicap event with Don third. Respectively we won a coffee set and an umbrella; plus our third team place won us sets of bathroom scales! Nevertheless, this race was a serious challenge. The start was at King’s Buildings, and then you swooped downhill and over a few undulations past The Hermitage. A left turn transformed things, as you struggled up a series of very steep slopes, before emerging on the road which skimmed past the Braid Hills golf course. Then it was a screaming descent and nasty little climb before passing the start again. Nowadays the race continues as the EU Five Miles but in the past real men had to face two laps of this exhausting trail. It would appear that I also finished second in the 1976 version but now I can only guess that it was Doug Gunstone who was well in front, probably in 49 minutes or so. Certainly I never beat 50 minutes in this race. 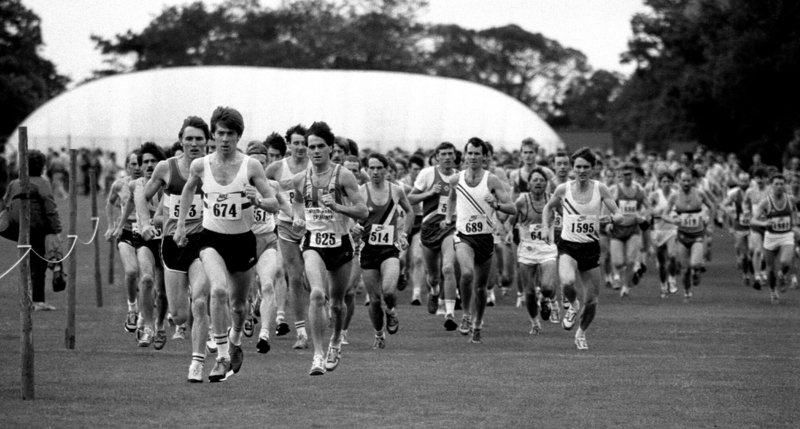 1979’s race on Saturday 3rd March was a bad one for me – only 7th in 52.34. Aberdeen’s Graham Laing won in 50.43, from Doug Gunstone, Don Macgregor, Dave Clark, Fraser Clyne and Martin Craven. ESH finished second team, and each of us won sixteen Mars bars! On Saturday 1st March 1980 I fought hard but failed to beat Sandy Keith of EAC. He handled the downhills much better than I did and in the end was well clear (50.47) to my 51.05. I only just stayed in front of my ESH club-mate Alex Robertson (51.11). At least this let me retain my club championship, and with the assistance of Martin Craven we won the team prize. I received four cans of beer, a homebrew kit and a jockstrap! Next year was a classic. On Saturday 14th February a really good field turned up – because Robin had made it known that there would be malt whisky prizes. Consequently luminaries like Nat Muir and Jim Brown made the trek eastwards! I possess a photo of myself leading both of them – but naturally not for long, although my diary notes with incredulity that I stayed in front of the great Nat for two whole miles. Muir set an impressive new record of 48.37 to win his choice alcoholic prize, with Jim Brown only eleven seconds down. Other fast times were set by Jim Dingwall (49.19) and EAC’s Yamada (49.24). I managed 50.32 to secure the ESH club title and a distant fifth place, in front of several good Scots and Northern English runners. That would seem to have been my last attempt at this unusual yet testing race. However I remember that a year or two after that there was heavy snowfall and cunning Evan Cameron defeated Don Macgregor in this ten-mile “road” race, because he had the sense to wear spikes! The EU 10 miles seems to have started in 1965, and there is a set of results from10th June 1967 when Jim Wight (EU) finished in 50.55, in front of Gordon Eadie (Cambuslang) 51.14 and Dave Logue (EU) 52.11. EU won the team race. The present course was adopted in 1970 and I am not sure what the 1965-69 course might have been. Below are the top two and winning teams from 1970 to 1981. I would hope that you noted the quality of the athletes who took part in the race – and there was a significant depth to the fields as well. As Colin said at the top of his article, it was not a fast tail but the runners all knew they would have a good hard race and learn a bit more about themselves – as well as having a good time.